We're Safe, Secure & Responsive. We offer You Peace of Mind. We Love Cars - Plain and simple; we love their lines, the power, and the thrill of driving. We are huge car people ourselves. We believe in treating your vehicle as well as, if not better than our own. GPS Tracking - We have it in all of our trucks all the time. In the event that we can't reach a driver via cell phone, we'll always know where your vehicle is and be able to let your know. We are available and accessible to you. If we can't pick-up the phone when you call, we'll call you back shortly. Your peace of mind is a primary goal. We take excellent care of all our equipment. Our fleet of up-to-date vehicles keeps your vehicle safe and secure during the transportation process. Customer Satisfaction - Details do matter! We hold ourselves accountable and pride ourselves on seamless deliveries that we're sure will meet your expectations. Personal Service - We are honored to give the best service to each and every client, whether we are hauling your $250,000+ Ferrari or your $10,000 minivan. We hire the right people who share our values. Employee background checks, as well as random drug tests are done on every employee to assure a quality transport experience. We are strategically located off I-70 in Grand Junction, Colorado. This allows for efficient and timely pick-up and delivery of your vehicle. We are here to serve you no matter what type of car or truck you have- however, transporting fine vehicles is our passion and specialty. Whether we pick-up your automobile at your house, office, car show or other specified location, we are here to accommodate you and serve your needs. We have had the privilege of transporting vehicles for many awesome clients like you, including the SEMA show, Barret Jackson Auto Auction and the Colorado Rockies baseball team. It's a fairly simple process to get started. You can either call us directly at (970) 712-3867 or fill out the form on the right and we'll get back to you right away. Depending on your needs we have different types of carriers from open trailers to fully enclosed units. We serve and pick-up from west of the Mississippi, but can haul anywhere in the USA. Our location off I-70 in Grand Junction, Colorado allows for efficient and timely pick-up and delivery of your vehicle. Our Dispatcher will call you to discuss the specifics and provide you with a quote and our payment process. We'll contact you between 24-72 hours before your scheduled pick-up. The driver himself will call you 1-2 hours before he arrives for the pick-up. Before loading a vehicle we will fill out a B.O.L. (Bill of Landing) that confirms that we are in fact picking up the correct vehicle and taking it to the correct destination. Before loading we'll note existing damage (if any) to the vehicle. This documentation will provide verification and agreement on the condition of the vehicle prior to transport. Both you and the driver will sign and date all paperwork. A carbon copy will be given to you before the driver departs as well as at the delivery destination. Drop off times are coordinated between the destination customer and the dispatcher before the driver picks up your vehicle. The driver will contact drop off location customer 1-2 hours before arriving at the destination. At the drop off destination point the vehicle will be inspected and the paperwork (B.O.L.) reviewed so that the delivery customer knows that the car has been delivered in the same condition as it was when it was picked up. A carbon copy will be signed and left at the destination location. You will be personally notified that the haul has been completed and all paperwork has been finalized. Mission accomplished - safe and securely. Want to SCHEDULE A HAUL? Thanks for checking out our website and taking time to fill out our form. I will be back with you very shortly. At Wheeling Wheels our Safety protocol includes not only the transportation of your vehicle, but also includes the car care on-loading, hauling and off-loading procedures. Our customers speak for our services. We feel the best way to hear about Wheeling Wheels is from our clients. Whether you're a one time customer or a regular client--while our appreciation increases, our quality of service stays the same. "I had a nightmare of an ordeal booking my auto transport through a broker, but once Mike from Wheeling Wheels was assigned to be the actual transporter, things went smoothly. Mike was honest, stayed true to his schedule, and stayed in communication with me throughout the process and even delivered the car ahead of schedule. I will certainly use Wheeling Wheels and recommend them to anyone looking to transport in the Colorado area. Thanks for fixing my nightmare!" 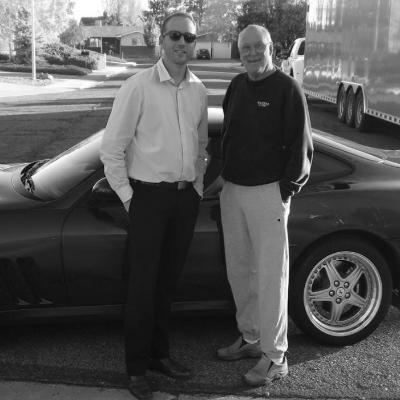 "On two occasions this year my wife Carol and I have used Wheeling Wheels to transport our Ferrari from Grand Junction, Colorado to Salt Lake City, Utah. Adam and his staff have done a super job. His equipment is excellent. He meets his time commitments and we couldn't be more pleased with the service. Our automobile was cared for perfectly arriving exactly as it was when picked up. We would highly recommend Adam and Wheeling Wheels for your auto transport need. We are sure you will be satisfied." "I'm very happy with the service I received from Wheeling Wheels! I used Wheeling Wheels to ship my last two vehicle purchases. In 2013 Adam transported my BMW M5 from Irvine, CA to Grand Junction, CO and in 2014 he delivered my Ram 2500 from Phoenix to my front door. Adam and his team are top notch!" Your car's transportation might require more that hauling it from point A-to-B. Many times the pick-up date and delivery date do not coincide and storage might be required. Wheeling Wheels has secure outside locations as well as climate controlled storage for your vehicle. During your initial conversation with our professional logistics experts they will discuss your specific hauling needs. Our turnkey hauling operations includes the pick-up and delivery to your desired location. Whether that's at your office, house, auction, trade show or any other location west of the Mississippi. It's typical for the pick-up date and delivery date to not coincide. We have storage facilities in many different locations across the West. These facilities feature fully secured yards with climate controlled storage options available. With our GPS tracking we are able to locate your car wherever and whenever you wish. We understand that your car is important to you and being able to locate it during the transport process can bring you peace of mind. Born in Bakersfield, California Adam attended kindergarten through his college years in Bakersfield, CA. He moved to Grand Junction, Colorado in 2006 where he founded Wheeling Wheels in 2012. Adam travels extensively and has enjoyed: Thailand/Cambodia/Laos/Japan/New Zealand/Puerto Rico/Costa Rica/Columbia/Equador/Mexico/ Peru. He also loves camping and off-road motorsports. He has one son and two dogs and loves new experiences and meeting new people wherever he travels in the world.